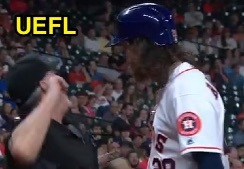 HP Umpire Dana DeMuth ejected Astros LF Colby Rasmus for arguing a strike two call in the bottom of the 6th inning of the Orioles-Astros game. With one out and none on, Rasmus took a 3-1 fastball and, later, 3-2 knuckle curve from Orioles pitcher Chris Tillman for called second and third third strikes. Replays indicate the 3-1 pitch was located off the outer edge of home plate (px 1.306) while the 3-2 pitch was located over the outer edge of home plate and navel high (px -.827, pz 3.116 [sz_top 3.510]), the call was incorrect. At the time of the ejection, the game was tied, 2-2. The Astros ultimately won the contest, 3-2, in 13 innings. This is Dana DeMuth (32)'s first ejection of the 2016 MLB regular season. Dana DeMuth now has -1 points in the UEFL Standings (1 Previous + 2 MLB - 4 Correct Call = -1). Crew Chief Dana DeMuth now has -1 points in Crew Division (-1 Previous + 0 Incorrect Call = -1). This is the 59th ejection report of the 2016 regular season. This is the 30th player ejection of 2016. Prior to ejection, Rasmus was 0-3 (SO) in the contest. This is Houston's 3rd ejection of 2016, 2nd in the AL West (TEX 4; HOU 3; LAA 2; OAK, SEA 0). This is Colby Rasmus' first ejection since August 26, 2015 (Sam Holbrook; QOC = N [Balls/Strikes]). This is Dana DeMuth's first ejection since September 1, 2013 (Robin Ventura; QOC = Y-C [Catch/Drop]). Wrap: Baltimore Orioles vs. Houston Astros, 5/24/16 | Video available via "Read more"